The team at Orange County Economic Development (OCED) is highly skilled in all aspects of business development, from site selection and financing to customized market research. The Orange County Economic Development team offers: business expansion, retention and relocation assistance; small business and entrepreneur support; information on commercial and industrial space availability; and customized research. Orange County Economic Development also oversees the Chapel Hill/Orange County Visitors Bureau, Chapel Hill and Orange County NC’s official Destination Marketing Organization (DMO). The Town of Chapel Hill is working to innovatively and proactively diversify local economic opportunities by retaining and supporting existing jobs, and attracting new, desirable jobs in locations convenient to transit and housing. Their goal is to build a sustainable economy within the context of the Town’s adopted Comprehensive Plan which places importance on the built and natural environment, community character, transit orientation, social equity and quality of life. The Chapel Hill Downtown Partnership is working to bring the resources of the Town, University and downtown community together to maintain, enhance and promote downtown as the social, cultural, and spiritual center of Chapel Hill through economic development. 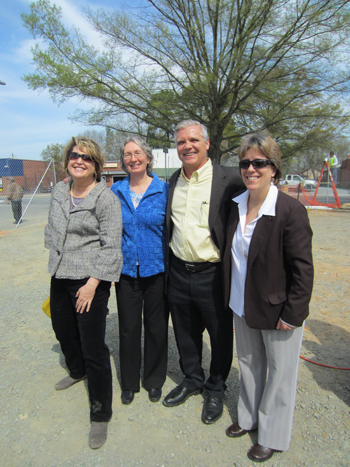 The Department of Economic & Community Development works to promote and enhance the economic well-being of Carrboro, promote and facilitate the development of safe and decent housing for Carrboro residents by encouraging the creation and retention of quality jobs for Carrboro residents and to advocate economic balance, which promotes geographically focused actions where needed and which address areas of economic need and opportunity. The Research Triangle Park is home to more than 170 global companies, including IBM, GSK, Syngenta, RTI International, Credit Suisse, and Cisco, that foster a culture of scientific advancement and competitive excellence. RTP is located between three major universities, including the University of North Carolina at Chapel Hill. Through five decades, the Park still holds to its founders’ aspirations: to generate economic activity, engage the talents of local graduates and citizens and carry North Carolina forward to ever-greater prominence and prosperity. As the Research Triangle Regional Partnership (RTRP), our mission is pretty simple: Keep good things happening in the 13-county region. That means working closely with businesses, educational institutions and government organizations, continuing to foster the innovation and collaboration that have put us at the top of all those “Best places to live and work” lists. Wake County Economic Development, in partnership with our regional economic development organizations, including the Greater Raleigh Chamber of Commerce, Competitive EDGE4, Greater Durham Chamber of Commerce, Orange County Economic Development, Chapel Hill-Carrboro Chamber of Commerce, Research Triangle Foundation and the Research Triangle Regional Partnership, has begun laying the groundwork for a proactive talent initiative, called “Work in the Triangle, Smarter From Any Angle.” The campaign’s goal is to showcase the Triangle nationally and internationally as one of the top destinations for talented professionals in the next five years. The N.C. Department of Commerce is the state's leading economic-development agency, working with local, regional, national and international companies. The department’s mission is to improve the economic well-being and quality of life for all North Carolinians.